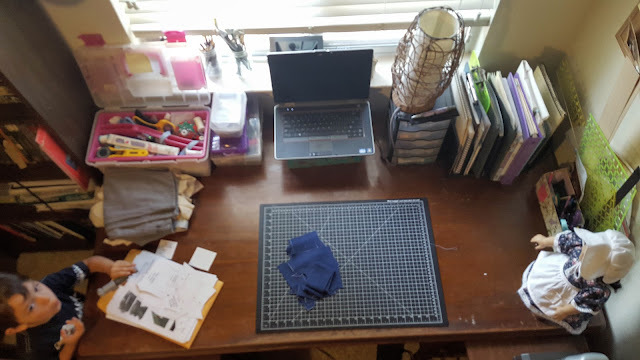 The smallest bedroom in the house is the "office" that I use as my crafting space. 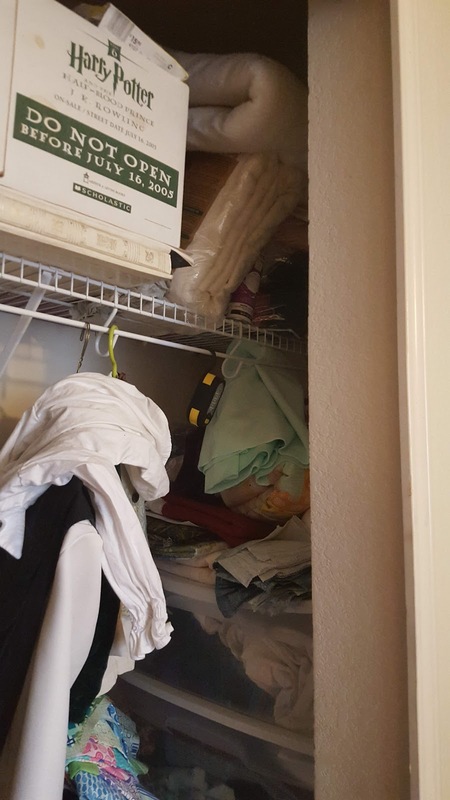 This is the view when you're standing at the door. The bookcase between our two desks holds various fantasy and sci-fi series, plus all of Gunnar's D&D manuals and school Textbooks. 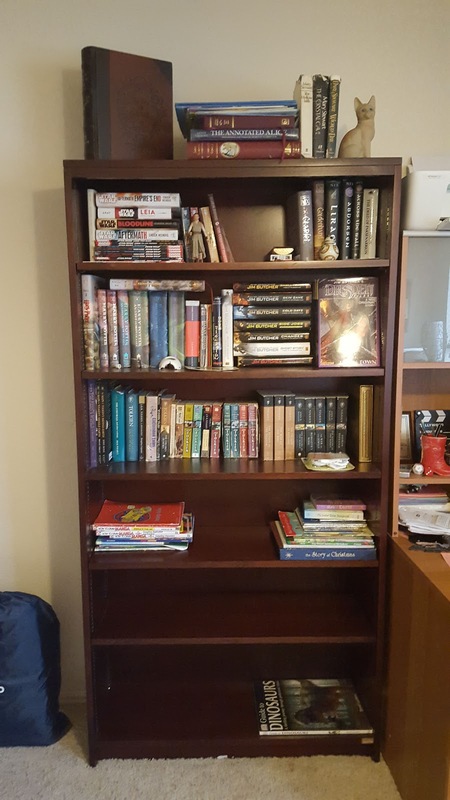 These bookshelves were bought from a friend of mine who salvaged them from a bank that was closing. They are very heavy and solid! 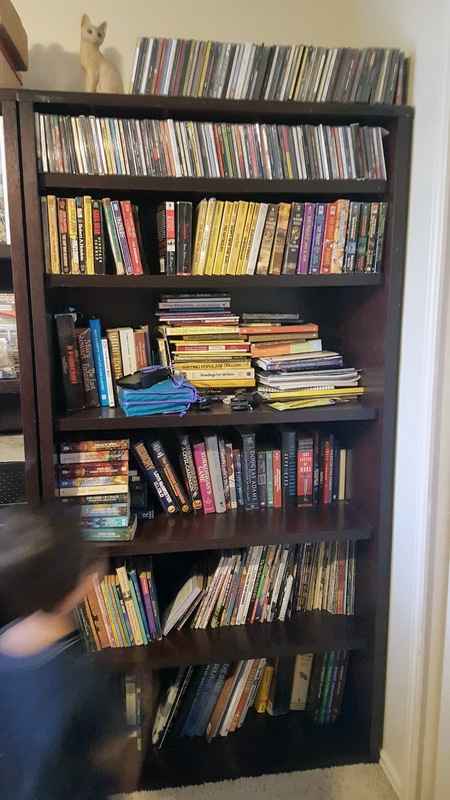 The one closest to the door holds Star Wars, Harry Potter, and Lord of the Rings. 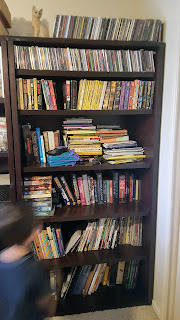 (The empty shelves used to have kids books, but we recently got them their own bookcase.) 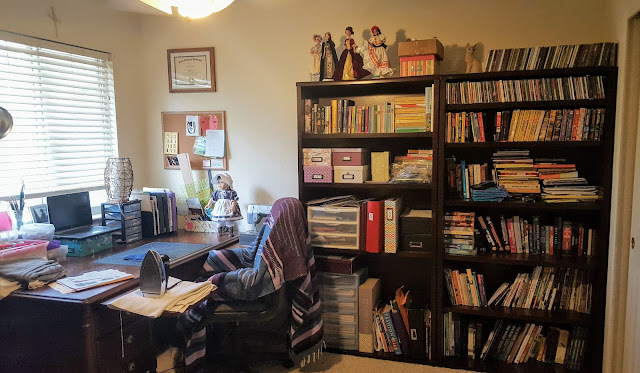 The shelf in the middle picture is directly on my right when I'm sitting at my desk and has top to bottom; my favorite childhood books, photos in boxes and a few comics, scrapbooking paper and supplies, and more scrapbooking paper and my fashion and sewing books. The shelf beside it, closest to the closet, holds CDs, Terry Pratchet, Nonfiction, and a bunch of unsorted stuff we aren't sure if we're keeping. My desk from above. The desk itself was $80 on craigslist and was actually too big to fit through the bedroom door so we sawed off the bottoms of the legs. It is huge and solid and old and scratched up, which I love because it means that if I scratch it or stain it I didn't ruin anything. It has two handy pull-out surfaces that I use when I'm sewing; iron on the right, machine on the left. 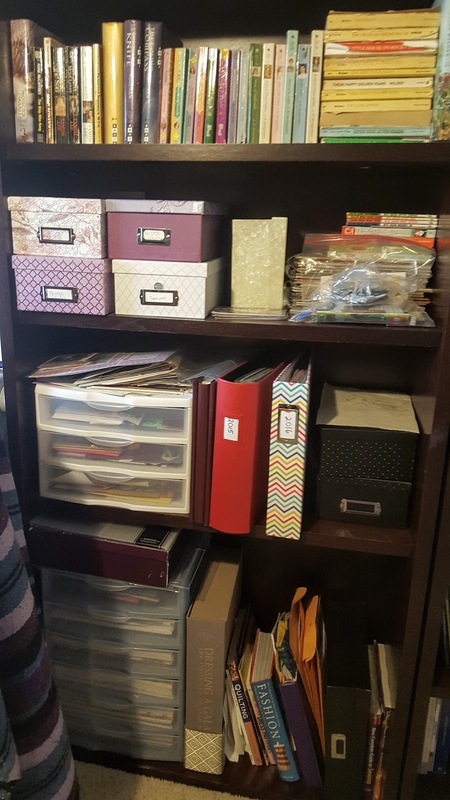 I have my pink toolbox full of sewing tools, my laptop for Netflix, a drawer full of pens and sticky notes, various files full or drawings and stories, and my quilting rulers and pens on the side. Gunnar's side of the room. 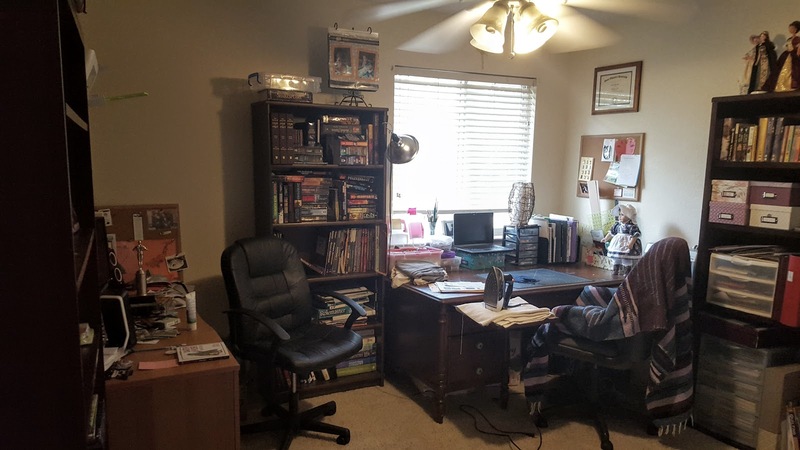 He mostly uses his dual computer screens for D&D planning, but he wants to get back into video editing. 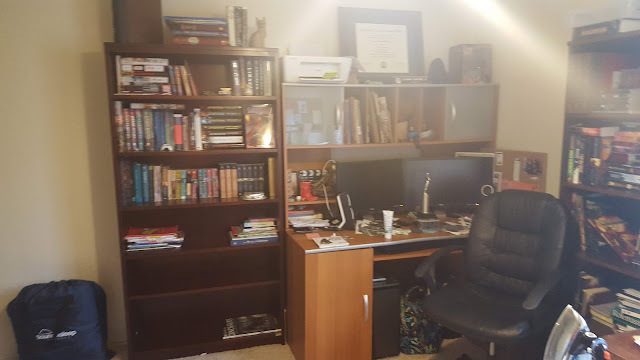 My area of the room. Barbies from my childhood: Pioneer Barbie, Irish Princess Barbie, Winter Princess Belle, and Mexican Barbie. The chair is a really old office chair that my old cat clawed to shreds. I draped my lovely Mexican Blanket over it. The closet is a crazy mess right now, but I'll give you a peek: My patterns are in the Harry Potter box, current projects hang fro the bar, and my fabric in rubbermaid drawers is stashed along the side. 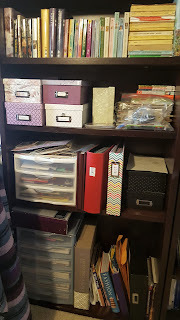 I also keep a drawer unit full of sewing notions like zippers, ribbon, and interfacing in there somewhere.